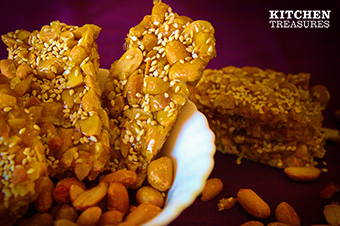 Kappalandi Mittai / Peanut Candy is the childhood favourite sweet for all. Rediscover the old school memories, make the Peanut candy today! Roast and peel the peanuts. Halve the peanuts, spread onto a flat surface and crush it lightly using a rolling pin. Lightly roast the sesame seeds till the color begins to change. 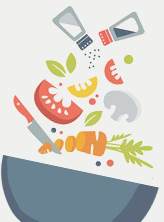 Grease a flat surface -either cutting board, kitchen slab or inverted steel plate with butter. Spread half the roasted sesame seeds on the greased surface evenly. Heat a thick bottomed pan. Add sugar and cardamom powder to this and stir it using a ladle till the sugar melts and the color changes to brown. Switch off the flame and add the crushed peanuts. Mix this well and quickly, it will harden very fast. Transfer this mixture from the pan to the greased surface and roll it out using a rolling pin. Sprinkle the remaining sesame seeds on the top. Let it cool for 15 minutes, cut or break and serve.